2. 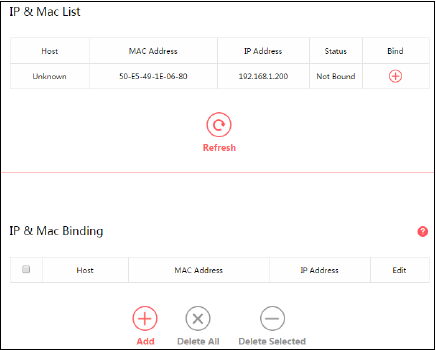 Under Advanced configuration, go to Network→IP & MAC Binding, you can control access of a specific computer in the LAN by binding the IP address and the MAC address of the device together. Host - The name of the computer in the LAN. MAC Address - The MAC address of the computer in the LAN. IP Address - The assigned IP address of the computer in the LAN. Status - Displays whether the MAC and IP address are bound or not. Bind - Click to add an entry to the IP & Mac binding list. Click Refresh to refresh all items. To add an IP & MAC Binding entry, follow the steps below. 2. Enter the Host name. 3. Enter the MAC Address of the device. 4. Enter the IP Address that you want to bind to the MAC address. To edit an existing entry, follow the steps below. 1. Find the entry in the table. 2. Click in the Edit column. 3. Enter the parameters as you desire, then click Save. To delete existing entries, select the entries in the table, then click Delete Selected. To delete all entries, click Delete All.